Glendale’s series of lease deals to lure and keep the Arizona Coyotes in town have always been among the worst in sports history: The city built a new arena at its own expense and charged the Coyotes only $1 minimal rent [EDIT: see comments for more on the Coyotes’ past and present rent situation], gave the team $50 million in operating subsidies to keep its owners from leaving town after it filed for bankruptcy, then agreed to pay another $15 million a year for the next 15 years to ensure that the team stays put, leaving the city with a budget drowning in red ink even after laying off a quarter of municipal workers. That was all bad enough, but what may kick this over the top to Worst Sports Venue Deal Ever: Glendale gave the Coyotes owners an out clause that will let the team move even if it’s not losing money. The $15-million from Glendale is recorded as revenue on the books of the company [George] Gosbee and [Anthony] LeBlanc formed to manage the arena, not on the books of IceArizona, the company that owns the Coyotes. While that money eventually flows to IceArizona because it owns the arena manager, for perfectly legal accounting purposes the parent company can claim a larger loss on its hockey operations, which ratchets up the number for the escape clause. Just as important, it also means the $15-million is not recorded as hockey-related revenue, which has to be shared 50-50 with the players under the collective agreement. So not only is Glendale paying the Coyotes to play in its arena, it’s agreeing to let the team owners claim unmanageable losses by not counting those payments on their books. That is some kind of crazy. Now, it’s always possible that Gosbee and LeBlanc (and possible new majority investor Andrew Barroway) won’t exercise the escape clause, because where else are they going to find a city that’s willing to give them a free arena plus $15 million a year in cash while doing so in such a way that they’re still eligible for NHL revenue-sharing payments. But then, they don’t have to actually exercise the escape clause to make use of it — they can use the mere threat of it to try to extract even more concessions from Glendale in a revised lease. You may think Glendale is tapped out by now, but when you’re this far down the road in a long con, there’s nothing left to do but see how far you can push your mark. This entry was posted in Arizona Coyotes by Neil deMause. Bookmark the permalink. So, if the Coyotes really were to split, does that necessarily mean that the management company stops getting paid those $15M a year, or do they continue to manage the empty arena? They’d have to opt out of the lease to move, which would mean no more payments. At least, I hope so. At this point, nothing would surprise me about what madness is buried in this lease. If you are Glendale, why would you want to give $14.5 million to the 29 other NHL teams instead of the Coyotes (as would happen if the arena operating money were counted towards NHL revenue sharing)? I’m told they are losing $20m a year including those arena management payments (of which, to be fair, not all is a direct subsidy. The running of the arena on hockey nights is an expense the team should bear, but operating & maintaining it the rest of the time absent being arena manager is not… so perhaps $3-5m of that fee is reasonable for Glendale to pay any arena manager). That may seem horrific, but it’s really just a continuation of a long history of net operating losses before adjustments in the $33-$37m range annually. When Moyes tried to sell the club to Jim Balsillie (while Bettman and Daly were on an airplane headed for Arizona to revoke his franchise, we are told…) and ultimately put the club into bankruptcy, he claimed he was losing about $40m a year. Some of that included unpaid debt to his own companies that provided ‘service’ to the club, but nonetheless… Bettman appeared on TV and announced angrily that the losses were “nothing like” the former owner had claimed. After the NHL had to buy the club out of bankruptcy, they ran it for two plus seasons and lost… yep, $35m per. Barroway is an interesting figure (I wonder if his lawsuit against Charles Wang had to be settled before he could join the Coyotes?). I have always believed that the $50m in red ink out clause was the only reason that Gosbee/Leblanc bought the club (despite what they say). I suspect the same is true of Barroway. The Coyotes have essentially zero value in Glendale. That said, so long as the $15m in checks keep coming to the Arena management company, they might stay and farm the subsidy. The Coyotes generate less than $20m in gate revenue a year. No-one watches on television (many games are in the 6-10,000 viewer range). They would need a destination that can earn them at least $35m in gate revenue to make it worthwhile, but I don’t think that will be a problem a couple of years down the road. Both Quebec and Vegas have modern arena projects on the go… If the NBA/Hansen can get it’s act together (more difficult now thanks to the Donald Sterling franchise value dividend), Seattle could soon be an option as well. Ben: Sure, but then don’t use the finances of the team, absent the arena management arm, as the basis for the out clause. It’s like helping your client negotiate a tax shelter, then having to accept nonpayment for your services because he claims his taxes show he’s broke. John: Is that $20m net loss inclusive of revenue-sharing checks? Shoalts implies that those should be putting the Coyotes in the black, or close to it. Seattle’s City Council was not going to be giving any outright payments to Hansen in pursuit of a team. The City Council recently reverted from at large to a hybrid district-based with some at large and all council members are facing a late 2015 re-election after years of complaints about representing downtown interests too heavily. It will be a very, very icy reception if anyone is expecting an operating subsidy for an NHL team, even more icy than any suggestions of re-opening the MOU to a “hockey first” design. Having tax havens and shell companies is pretty common. Yes….it looks and in lots of cases is a little sketchy but this is hardly the only industry doing such a thing. I’ve commonly thought these are owners creative ways of claiming losing money when it comes to Labor negations. Shoalt’s claims might have some validity but he has always had an axe to grind with the Coyotes and I wouldn’t consider his reporting that great. Lots of sketchy sources that sound no different than conversations we have around here. What I have a hard time forecasting is the Coyotes owners exit strategy? They will not be the owner in Quebec and I doubt they would be the owner in Vegas so do they just flip the franchise after 5 years to make a pretty penny for babysitting? Maybe. Why is Neil always supporting the $200 million dollar give away to Chris Hansen and demonizing everyone else. Odd if Seattle was such a great market and Steve Blamer paid at least $2 billion for the Clippers why didn’t he self finance any new arena in Seattle? Seems to me put your money where your mouth is, doesn’t apply to these ones. With that $2 billion Balmer/Hansen could have nearly self financed the new area AND bought an NBA team. Subsidies are “evil” for some and very well deserved for others I guess. You can’t attach a price tag to civic pride. JD, when have I supported the Hansen deal? I’ve said that Seattle would probably come close to breaking even on the deal — which it would, at least if you don’t count the white elephantizing of the Key Arena as a loss — but that’s hardly a ringing endorsement except in the “better than a poke in the eye with a sharp stick” sense. Don’t forget the google adwords spike that everything Seattle brought when Hansen linked to you as an endorser of the deal. Wasn’t it like $15 or so ? What are you joking Neil!, you were and are still a huge cheerleader for a Hansen subsidy. I guess the why describe your “journalism” is “moral” relativism. What chielfjoe, Neil sold out faster than the iphone!!! What a fraud he is. Mmhm. Can you provide an actual example? Neil, the $50 million “out clause” has been known for more than a year! What are you last man on the deal team, or does a certain “entity” pay for your hush-hush treatment? You can no refer to the Hansen subsidy as a “tax incentive” if that makes you more comfortable. You know Shoats has already been wrong multiple times, but why let any truth get into a biased argument. Seattle is a great market, just ask the Mariners!!! Okay, “What are you last man on the deal team” wins attempted insult of the year, hands down. Needless to say, I’ve never called the Hansen subsidy a “tax incentive,” but if you get tired of beating up on your straw man, I’ll be over here. – Debt service cost to Fortress of avg $15m (I don’t know what terms the NHL loaned the ‘owners’ half of the purchase price on, but let’s say it’s sub market – 3% or so). So yes, Shoalts claim is almost true… if you forget about the $30m in false revenue and $15m in ignored expenses. MikeM: Well, you’re right. I can’t put a price on it… but apparently the club owners can…. Have you seen the “he said, she said” on the Rams supposedly meeting with the mayor of Inglewood? 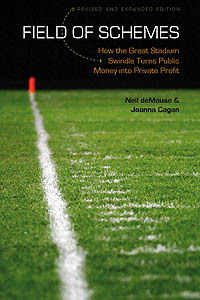 @JD, Unlike how you or I might be very against giving a public subsidy towards these sports teams/stadium projects, Neil takes a position of studying them and tries to report any merits/pitfalls (as so often gets left out by local press). It’s not that he endorses any project over another, it’s just that his scale is “how big are the potential costs in a deal” and leaves it to the reader to debate if that’s really a wise use of funds/tax subsidies. All mixed in with a lot of snark. Truth be told, Hansen’s deal with Seattle isn’t all that bad if you had to build an arena (and I even put one of those rotating ads up in the corner). I still think nobody in Seattle “has to” build a new arena with public funding… especially with that potential co-owner willing to so vastly overpay for an NBA team. To claim that anything written by Shoalts shows a complet lack of a grasp on the truth. He may be the biggest liar on anything Coyotes in the world. Next, the Yotes have never paid only 1$ a year rent. You keep making that false claim which tells me you have no reguard for the truth. Why do you ignore the Forbes report that the loses were “only” 8.9M? HAve you seen the books? So, anything you report is a guess, just like Forbes. Next, the 15M “subsidy” The Cotes returned around 6M to the COG of that last year. Another reality is the cost to run the arena (Which comes out of the 15M) was 6M a year by the COG’s figures. Many other similar sized arenas take a lot more to operate. So, the net amount of the 15M is not close to the real number. Something you fail to acknowledge. Another reason you cant be taken honestly. With the new investment by Barroway, the 15M from Glendale that is currently pledged to the Fortress loan can be freed up for other uses. If you really wanted to be fair and accurate, you would have reported that with Barroway (a US citiezen) they debt service is around 9M year less because of tax laws beine different for a US owned team as opposed to the CDN owned team. So, in the end this will cost the COG around 6-8M a year. The “Indirect” income from the area around the arena will help offset that even more. Once again a point missing from your comments. See, yuo dont want to be accurate, you want to tell half truths to prove your bogus point. In at least one case, you use an outright lie to try to prove your point. I have an idea……….why dont you ask the same thing of Winnipeg and Manitoba? They give the TNSE over 12.9M a year in subsidies. The latest off sets the TNSE payments on the arena so the TNSE owns it, but the tax payers are subsidizing the payments. How does that work? Here is a reference…………..http://www.canadafreepress.com/index.php/article/45899#.T4zelXuToeo.twitter. It has actually gone up to 12.9 since the story was written. So, why dont you talk about this deal? Its far more money than the COG is paying the Yotes after it gets their “rebates”. Funny how you intentionally fail to report all that. If some of your people commenting had done any homework they would have discovered a fes thing. The Yotes will get 25M in revenue sharing. They will get 3M a year in new naming rights. They will get the 15M from Glendale that as soon as Barroway becomes owner, that will be freed up because it wont go to pay for the Fortress loan. If you had bothered to check, the loan from the NHL has no payments. It is due in 5 years. it is also not known how much of what the NHL pledged has been used. They also get around 10M a year from the CDN, US and local TV contract. Those figures alone are at least 53M in revenue before a single ticket is sold. That doesnt even take into account ad and sponsor revenue. So far this year, ticket revenue is already 1.5M up over all of last year. All the figures you and other that commented for loses was complete crap. Moyes numbers were shown to be bogus in the BK. He was getting loans the hockey team had to pay and taking the money for his trucking company. He was over charging the team for both rent and travel to compaanies HE owned. The 25M the NHL recieved, once again they had to pay for the operations of the arena out of that. Since they were in that business, they didnt have many other events there which would drive up the cost of running the arena because of a lack of income from other events. Neil, your basic premise that public supported arenas are not worth it is correct in many cases. What I have an issue with is your ignoring ALL the facts to make your point. You lose credibility by doing that. When, you reference anything by the complete clown David Shoalts as being accurate, you get to having next to no credibility. he has proven many time over the years to be a liar. Why dont you ask him about his report that the IceEdge guys had bought the Man U soccer club? He is a fraud..
Time for the periodic reminder that personal attacks on other commenters are not allowed on this site. David Shoalts isn’t a commenter here, so calling him names doesn’t trigger this clause, but everyone try to keep things civil, shall we? • Yes, the Coyotes owners now pay $500,000 a year rent under the new lease. This is still a tiny drop in the bucket, though, compared to the rent of the deal. • All estimates of the Coyotes’ losses are guesses, yes. The one thing we know is that their paper losses are $15m a year more than their actual losses, because that’s how much city subsidies are being redirected into the arena management company’s ledger. • I’ve discussed previously the $6m a year or so that the Coyotes owners are paying to Glendale (http://www.fieldofschemes.com/2013/06/28/5435/coyotes-buyers-count-everything-but-kitchen-sink-still-cant-come-up-with-15m-a-year-in-value-to-glendale/). That doesn’t make the $15m subsidy checks any smaller, but if you want to net out every penny in Coyotes-related revenue that Glendale gets, sure, we can say that the city is only out $9m a year on the deal. Woohoo? • That’s nice if the Coyotes can now refinance their loan, but it doesn’t change their deal with Glendale, or save the city any money. • Yes, the Winnipeg Jets are getting a pile of tax breaks from their city and province. I have no idea what that has to do with Glendale and the Coyotes, but If you want a wagged finger, I’m happy to wag one their way as well. • So the point of your last comment is that … what, the Coyotes should have enough revenues to be able to turn a profit, even if they’re showing losses on paper in order to get revenue sharing and trigger the out clause in their lease? Isn’t that what I said at the beginning? I believe when you check. what the TNSE gets is much more than what the Yotes get. Doesnt that make that deal the worst lease in sports and maybe all time? Isnt that subsidy worse since the owners are making a profit? Fill the place every night and charge some of the highest average ticket prices in hockey? Why would anyone go through all the hassle to buy a team with the intent of losing 50M to move? That seems to be a consent among many including Mr Shoalts? I think its safe to assume the ONLY reason the NHL will expand into Canada again is for 1 reason only……the expansion fee. (which by the way would be a nice chunk of change for the Yotes). So, if the reports of expansion to Seattle and Las Vegas are true, and in reality there are a couple other franchises in trouble that arent in good TV markets etc, just what options are there for a team to move to that is better than where they are at? OK, back to your story. If and I know its a big if. Things go as planned, the COG will get almost 9M of its 15M a year back. They will only pay what they would have had to pay to run the arena W/O the team. Without the team the indirect income from the Surrounding Westgate area would be lost………..so, that makes your whole story…………..wrong? if you know the Yotes pay 500K a year, why did you omit that from your story? Why the $1 a year only? Isnt that inteneded to mislead your readers? The 15M a year from Gloendale IS NOT being directed into the Arena management part of this. That 15M goes to pay off the Fortress loan. The NHL does not require any repayment until after the 5 years is up on its loan. Now, with the infussion of money from Barroway, and the tax advantage by the team being owned by an American…………….the team debt is much less than what it was, which I believe has a positive effect on the bottom line. OK, back to the 500K rent being a drop in the bucket. They also pay $4.50 to the COG for EVERY ticket sold. Thats not a drop in the bucket to coin your phrase. See, I get your argument, but to say this deal is the worst of all time is way off the mark. I just cited another one that is in reality worse than this one. The fans and the city of Winipeg and Mannitoba are actually paying off the debt on an arena that is owned by the TNSE. How is that not worse than this? I bet there are many other deals that are worse. The bottom line is its likely that the COG will end up paying only 6-7M a year when all is said and done, not the 15M you all like to cite. If the story says “charged the Coyotes only $1 in rent” (i.e. states it in the past tense), and there was *ever* a time that was true, what’s with the witch hunt? As for your comments about Mr Shoalts. He has had it out for the Yotes since the current ownership pulled an April Fools prank on him that exposed just how he doesnt verify his stuff. He was told the Ice Edge had bought the Man U soccer team for a Billion dollars. He believed the same guys that he had been reporting for months that didnt have the 170M to buy the Yotes. he ran the story w/o ding any checking at all. Want more? The day that it was announced that Matthew Hulsizer was the new suitor to buy the Yotes, 2 hours before Mr Shoalts wrote a story about how he had pulled out. It was to be kind, a lie. If I was to go back 5 years, I could find 30-40 more reports from him that were no0t close to accutarate. I even have one of his gaffs that wasnt related to the Yotes. A couple years ago, Syd Crosby was injured and his participation in the All Star game was questionaible. Mt Shoalts ran a story where he QUOTED Crosby as saying he wasnt and didnt want to play. One problem. Crosby came out and said he had NEVER talked to Mr Shoalts. Mr. Shoalts later said he heard it from a “Source”. He has a lot of those type sources. My point, do yourself a favor and take anything he writes with a grain of salt. I believe what I just informed you of enables me to label him a liar. I dont believe the Yotes EVER only paid $1 in rent. Anyway, the $15m paid IS in regard to arena management as it is paid as part of an Arena Management Agreement. What the AM company does with the money once it is paid is discretionary (though, if as you claim it is not a subsidy and is “needed” for actual arena management costs, then there would be nothing “left over” to put toward the Fortress loan… which pretty clearly there is). Mr. Shoalts has been proven wrong on several occasions, James. But that is not evidence of an agenda on his part. It was not the present owners (Gosbee/Leblanc) that caught him with the Man Utd prank, that was Darryl Jones and other Ice Edge people – Leblanc’s partners in his first effort to buy the Coyotes. For nearly 20 years, the people of Phoenix (and then Glendale) have demonstrated clearly to the NHL that they are not willing to pay NHL prices (in NHL numbers) to watch NHL hockey. This franchise’s annual gate receipts are about half what they need to be for the business to be viable in Glendale. This franchise is a financial abyss. The only thing that will change that is Glendale taxpayers – already straining under the sports related debt their halfwit elected officials have encumbered them with – decide they are willing to pay $60 on avg to watch NHL hockey, and do so to the extent that that building is 95% full at least 35 times a year. Absent that, this franchise can only continue to exist if taxpayers of Glendale and fans of the NHL in general agree to pay to keep it alive. Okay, I think I’m starting to understand what we’re arguing about here. In Glendale, though, the $15 million a year in city cash payments to the Coyotes owners is *on top of* the $220 million that the city spent to build the Coyotes’ arena in the first place. So the Coyotes owners are double-dipping — or really, triple-dipping if you count the interim $50 million that Glendale handed over during the bankruptcy mess. Winnipeg’s stupidity pales by comparison. If you want something to give Glendale a run for its money, I’d suggest the Indiana Pacers’ deal with Indianapolis, where they got a free arena, free rent, and now $16 million a year in “operating subsidies,” similar to the Coyotes. (I’m still double-checking on the issue of whether the Coyotes paid $1 rent or what in their original deal — I’ve found an LA Times article from 2003 saying they’d pay “nominal rent,” but I’d love something more definitive.) The Pacers didn’t get $50 million in interim cash, though, or negotiate a sweetheart out clause, so it remains to be seen which city will get fleeced worse in the end. In any case, though, this isn’t about the *biggest* subsidy — on those grounds, there are plenty of giveaways that are larger. (The Yankees and Vikings each got more than $1 billion in public subsidies, for starters.) The term of art we were using here is “most godawful,” and for sheer “here, take my wallet, and my credit cards, and my other wallet, and the keys to my house, and here’s my PIN number and WiFi password and a map to my buried treasure,” I still think Glendale is the winner. You’re welcome to disagree, of course — that’s what makes awards season great. Besides, as Tolstoy said, every unhappy stadium deal is unhappy in its own way. FYI, I just edited this item to say “minimal” rent (which $500,000 certainly qualifies as) instead of $1. I know I got that $1 number from somewhere — I cited it in the year-old Al Jazeera America article linked to above — but as I can’t figure out where at the moment, better vague than sorry. Neil: The ‘original’ deal for the arena in Glendale included (that term again) ‘nominal’ rent. I really don’t remember what the number was, or if that number was ever revealed publicly. The deal also included a fixed cut of tickets sold (which I believe was $1.60/ticket, but don’t take that as ironclad) and a similar cut from cars parking at the arena lots (which I think was more like $2.75 per car). I do not recall how they determined which cars were parked at the ‘arena’ and which at Westgate in general, but perhaps that is an obvious matter to Westgate shoppers. During Mr. Moyes Bankruptcy case, the city revealed that it had received on average about $2.1m from the Coyotes in annual payments from 2003-2008 – about $4m less than the cost of covering the construction bond payments alone. When you say they spent $220m to build it, are you stating that in 2014 dollars? I have been told the construction cost was $185m give or take. Aha! Thanks, John. My bad on the $1, then — I probably got something confused in my original AJAM piece (the Glendale spring training facilities, I believe, do have a $1 rent) and have been repeating that error ever since. It’s still a low rent, but apologies for getting the number wrong. $220 million in 2003 dollars is what Wikipedia says, citing an Arizona Republic article of the time that is no longer available online. Judith Grant Long’s book, though, which I’d take over any newspaper report, says $230 million in 2010 dollars, which would be $194 million in 2003. Maybe we should just go with “$200-million-ish”? Also, I’m seeing $9-10m a year as Glendale’s remaining annual construction debt costs, not the $6.1 million you cite from the Moyes bankruptcy hearing. That would fit better with a $200 millionish price tag, though presumably some of Glendale’s costs were paid up front and not bonded out. I recall the city stating their construction bond carrying costs as $6-7m annually somewhere along the way (probably when they were busy telling everyone how much money they were going to make on this ‘investment’ up front). Can I ask where the $9-10m comes from? Is this a Glendale provided number or a math thing? I think the city lost the parking revenue somewhere along the way as well (maybe in the BK? Or possibly as part of the sale to IceArizona), I wonder if that makes up part of the difference? Out of curiosity, does the City of Seattle fare significantly better in the deal if that arena had two tenants? I don’t think Seattle has much of the “upside” of the arena, beyond maybe paying down the arena faster. Hansen’s deal is structured with bonds that get paid off via various pledged ticket taxes, city+county property tax receipts (paid by citizens because the arena the city is the arena-holder, naturally), sales/parking tax receipts, etc with Hansen making up what Neil projects to be shortfalls to cover the arena bonds. It was a proposal designed to be revenue neutral (unlike those Mariners and their lease with profit sharing provisions that have never paid out, ever). Of course, with two more pro franchises we’d have double the civic pride…. our city would be bazillionaires in that. I guess if two teams keep a new arena too busy to be booked then maybe Seattle would benefit from the city-owned KeyArena being less of a “secondary arena market”. We see a small KeyArena profit now (because nobody is planning any major renovations) but Hansen would obviously work extra hard to keep his new arena booked under a one-team scenario and that’s bound to cannibalize Key operations. Actually, Seattle taxpayers do *worse* if there are two teams, because then King County has to put up an additional $80m, as part of the deal with Hansen. King County is in for $5 Million in bonds under NBA only, $80 million under NHL only…. however, the gov was expecting more ticket tax revenues,etc to help cover the greater debt. Either way, the projection was Hansen would be making up the “shortfalls” in tax/arena revenues to pay off the bonds and I think that $4-5million/yr was sizable enough to absorb any increased collections from both teams. Early projections of annual revenue on pg 11 of this presentation, parceled out by city/county tax, base rent, and “additional rent”/hansen’s shortfall payment. doh… I meant $80 million with both NBA and NHL, not NHL only (who would want that, look at Glendale). There we go, in the later portion of this presentation, under both scenarios the County’s direct taxes were estimated as $13 million. The addition of the 2nd team actually causes the “additional rent”/Hansen shortfall payments to go from $44 to 120 million. Under either scenario, for all these funds, the city/county gets to own a new arena (with an lease to Hansen attached for most of its useable life). That’s $120 million nominal, spread out over time, so it doesn’t necessarily make up for the extra $80 million from the county. But yeah, it does look like Hansen at least made some attempt to have the NBA+NHL scenario be equal to the NBA-only scenario from the public’s perspective. Neil, you have done “business” with the Qatar rulers, do you need a history lesson? What did you believe gives a “subsidy” to al-jazeera? Neil answer this. Let the world know who your in bed with. They won’t be happy. I don’t think Sheikh Hamad spending money on Al Jazeera, the company that he owns, is so much a “subsidy” as an “investment.” Maybe a dumb investment, given the state of the journalism industry, but hey, it’s his money. Does that mean I’m not concerned about who owns the media outlets I write for? Of course I am. But the best I can do is try to maintain a position where I can take my work elsewhere if I need to, and keep independent outlets, like this site, where I’m only beholden to you readers, and the site supporters who sign up for memberships and sponsor the ads in the top right corner of this page. Not that I wouldn’t write nasty things about you if you secretly held meetings to evade public hearing laws, or worked migrant workers to death, or something. It’s a messy world, and none of our hands are truly clean. (I go to sporting events, too, and give my money to sports team owners who I criticize — does that make me a hypocrite?) The best we can do is to try to acknowledge the mess, and not let it stop us from trying to fix it regardless. Neil, they fund ISIS and other salafist Islamic terrorist groups, you fraud. Not about sports, readers need to know what you consider a “moral” relative. Sorry, don’t believe you. Maybe you can do an anti-capitalist rand for Russia Today or Pravda. I here they are looking for the next apostate or Edward Snowden. You could have been a good man, but now that you have given comfort to an enemy, I don’t wish to believe you are. This goes way beyond sports. As for the rest of it, JD, I’m happy to debate you privately about media ownership, Middle East politics, or Edward Snowden for that matter. But if you’re just interested in making personal attacks on me, or anyone else here, then it’s a violation of the site commenting policies and will not be allowed. Speaking of getting shafted … how do you like the fact that the attorney formerly representing Glendale’s interests in dealing with the Coyotes is now the attorney representing the Coyotes interests in dealing with Glendale? Can anybody please tell me why the NHL approved Ice Edge Holdings aka IceArizona’s bid for the Phoenix Coyotes and not Darin Pastor’s bid?